What makes you decide to read a book? Could it be the beautifully illustrated cover that lures you in? Or would it be the catchy title that piques your curiosity? More than likely you've glazed over the contents and jacket cover, convinced the subject matter is one you can't pass up on reading more about. Any or all of these could be why the comic book Malice in Ovenland Vol. 1 by Micheline Hess made its way from my nightstand to my daughter's backpack. 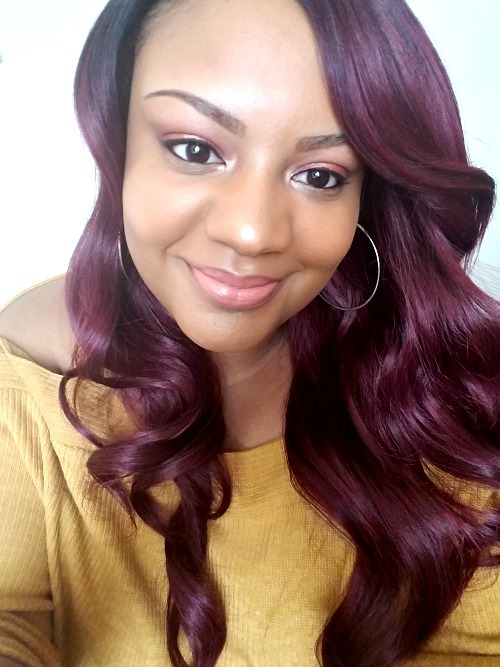 While it's no secret that we both love to read comic books and discuss them with each other, we rarely come across heroines that look like her. 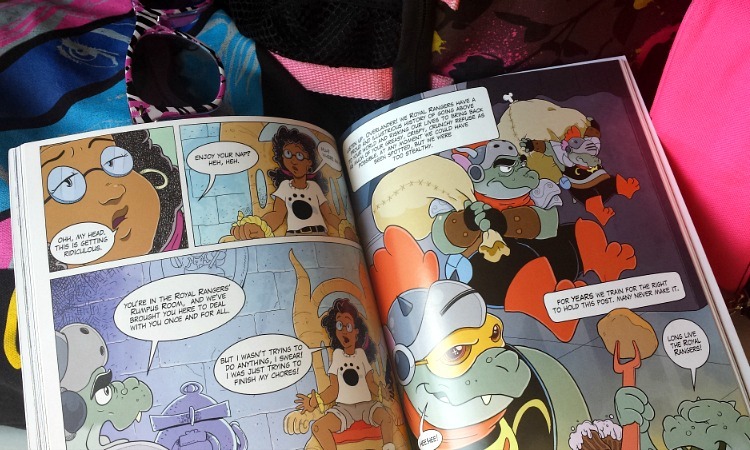 So when I was given the opportunity to read Malice in Ovenland and share it with my readers, I could not wait to talk to you guys about it! Of course you guys know I judged this comic book by the cover, right? At first glance, we see a young girl of color with a book in one hand and a torch in the other. How fascinating is that for those of us who've often looked for ourselves in books as children and rarely found resemblances? And if that wasn't enough to make me take notice, Malice in Ovenland's title is a clever play on Alice in Wonderland, immediately hinting at an epic adventure many of us are familiar with. These two distinctions in the cover made me so anxious to read Malice in Ovenland with the quickness. Amazingly enough, the rich contents kept me reading from cover to cover in one sitting. The beginning of this tale finds us in the middle of New York with curly-haired Lilly Brown, who lives with her mother. While she seems to enjoy school and learning new things, Lilly (like many other teens) does not enjoy doing chores at all. So when Lilly learns she'll be doing lots of cleaning instead of vacationing like her friends during summer break, you could just about imagine how upset she was! In addition to being frustrated with her "summer plans," Lilly is equally annoyed with her mom's new switch to a healthier lifestyle. Heading home after the last day of school with orders from mom to clean up and make dinner, Lilly assumes she's in for a boring break full of bland meals made from veggies in her mom's new garden. But after she finds herself in a bind after falling into the oven, Lilly winds up in a life-changing adventure she won't soon forget. Lilly Brown's adventure in Ovenland was very engaging. The author's pacing of the story and vivid illustrations does a great job of keeping readers invested in the story. With each flip of the page, I was wondering what Lilly would do next or how she would work her way through her dilemmas. Once you become engulfed in the groove of the plot, you almost forget you are learning a lesson about making healthy lifestyle choices with the foods you eat. This was just the reassurance I needed to know the lesson would not be lost on my children once I passed the read along to them. Subtle details in the reading like Lilly losing her ponytail holders and earrings immediately caught my daughter's attention, as she often does these things. And during a moment when Lilly's hair "puffed up" in the humidity, I gave an imaginary head nod to the author. 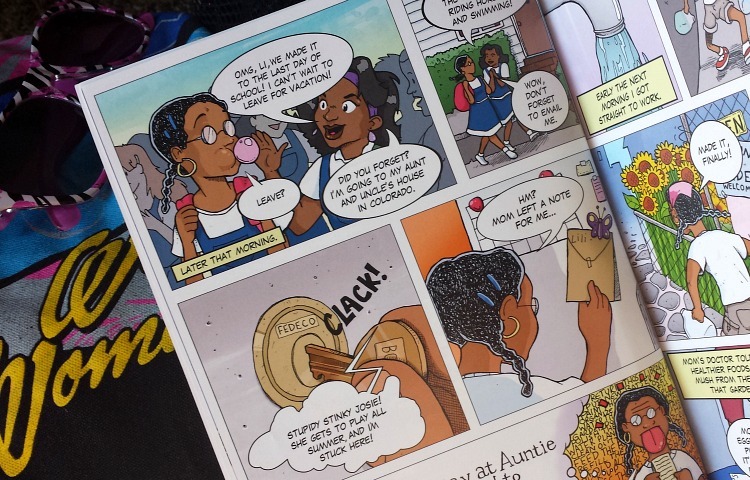 It was a moment all curly kids could relate to and I appreciated that Lilly shared and acknowledged the sentiment. Not only was Lilly a bright student, she displayed impeccable leadership skills. 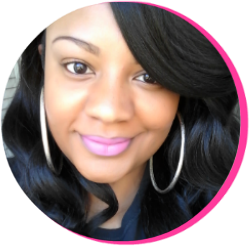 She took charge and created solutions for her problems in Ovenland, seeking help when needed. She stood for what was right even in the face of fear and danger. And a great help to others, Lilly was also an honest and loyal friend. Each of these qualities made Lilly a character I was proud to share with my family. All in all, Malice in Ovenland was a fun read for both my children and I. 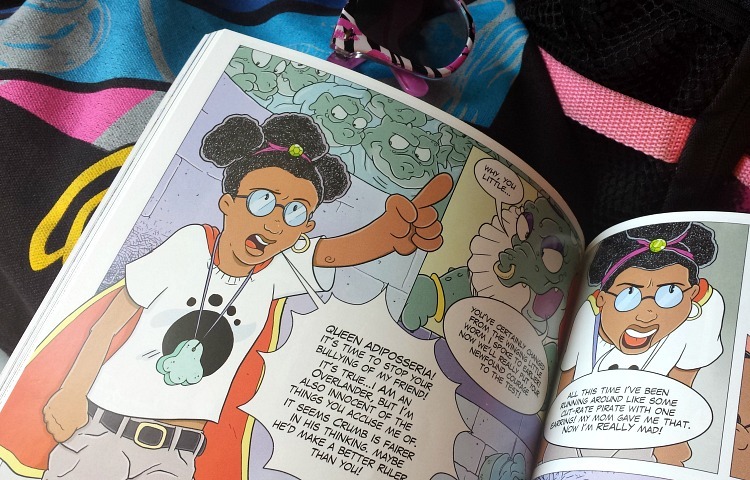 With this comic book, Micheline Hess tackles the issue of transitioning to a healthier lifestyle and delivers it in a fun and engaging way children will enjoy and understand. It's almost like jazzing up a new healthy recipe for the kiddies on Meatless Monday and it tastes so good that they don't even realize it's also good for them. Reading this book has created dialogue for my family about making our own (subtle) changes as far as our eating habits go. The context is not preachy or forceful, but it gets the point across. 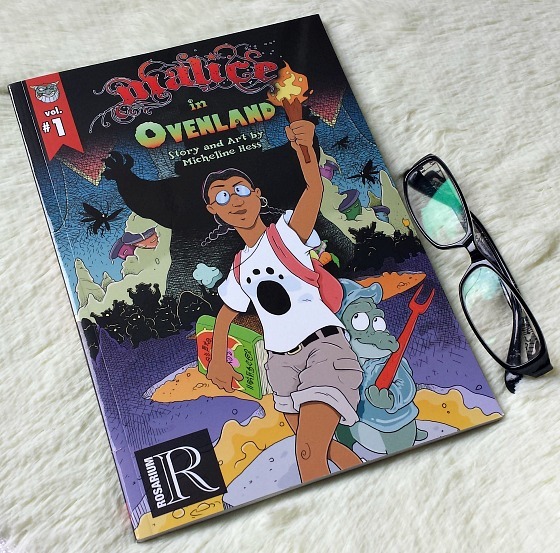 And as someone who hasn't read about health and nutrition in the form of a comic book with people who mirror my own family, Malice in Ovenland was a breath of fresh air. Our representation in literature is so necessary and well worth the read, y'all. Disclosure: This is a sponsored post, meaning I received compensation for sharing this book with my readers. However, all thoughts and opinions expressed are my own. To read more about my disclosure policy, click here.